This morning while Brady was eating breakfast, I scrolled through my Facebook newsfeed and saw this post from Sarah Jane Studios. I adore Sarah’s work and even have one of her prints hanging in Brady’s nursery. I admire her dedication to her family and her drive to build a business from her unbelievable talent as an artist. And this morning, I love her even more, for reminding me to stop and THINK about why on earth I’m doing what I’m doing anyway. 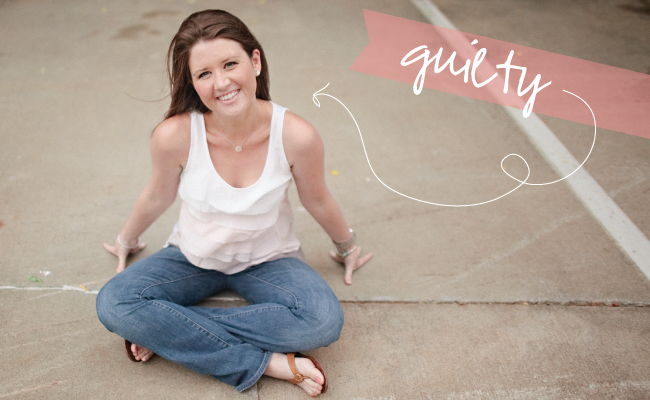 Whether you own a business or not, this concept is something that we as Mamas tend to let slip by us a lot. I know I do. We get caught up in the SUCCESS addiction, the SALES addiction, the ACCOLADES addiction and we forget about why we’re doing what we’re doing. Quite simply, we get caught up in the hustle and bussle of having it ALL and having it all together. What on EARTH. Thanks, Sarah. And thanks, God. For punching me in the stomach and telling me to slow down and stop being so addicted to the hustle. Something Sarah said in her post really stood out to me today and I hope it sticks with you too if you’re a business owner: there is a BIG difference between a small business and a big business. I’ve been blessed beyond measure with the success of my two ventures (Making Brands Happen and Emily Ley). But with success comes enormous responsibility and many opportunities to follow your gut. Sometimes you have to take a step back (even if your’e not a business owner) to take a step forward in the right direction. (Read those italicized words again, they’re the most important of that sentence). It’s about building the life you want for your family rather than adding 0s to your bank balance or seeing your name in lights. For me, I do this so that I can have the flexibility to be a mama and a job that fuels me to be a better version of me for my family. Because what good am I doing if I’m making adorable caramel corn parchment paper cones if I’m a stressed out mess while I’m creating them? Make sense? I’m learning more and more that this is what it’s all about. 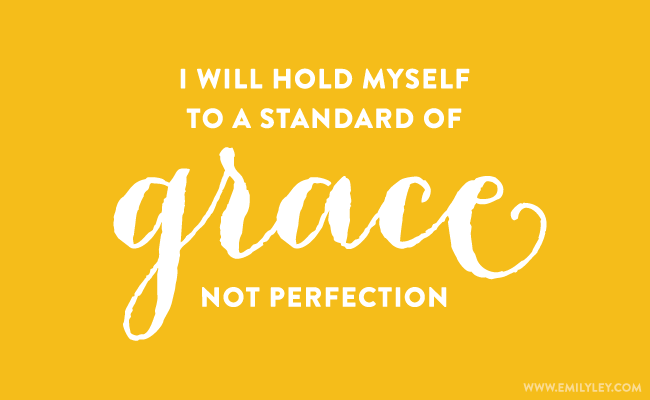 Grace, not perfection, my friends. 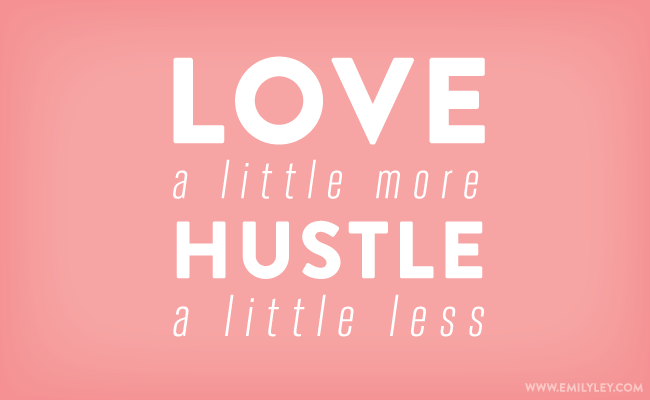 Love a little more, hustle a little less. Oh so true. I can have the biggest, best, most successful shop ever but if I am not making a positive impact on people and creating the life we dream of for my family, what does it all matter. I can create the cutest treats for Brady and his friends but if I am not teaching Brady kindness and showing him my love by these action, what does it all matter. I can make all the money in the world and see my name in big magazines and sell a gazillion Simplified Planners™ but if I’m not able to take Brady to the park on a Monday or enjoy his new words at the breakfast table because I have a hundred other things on my mind then what does it matter. I took Brady to the park this morning with my two friends McKay and Amy and their little ones. Fall is starting here (meaning, it’s no longer 100 degrees) and time with good friends + cooler air makes me want to jump up and down with excitement. I’m so grateful God punches me in the stomach exactly when I need it. I’m so grateful he puts things like this in my path so that I will slow down and SAVOR each and every moment. Brady is 19 months old. The best 19 months of my life. Happy Fall, y’all. Where, oh where, did the little town go?